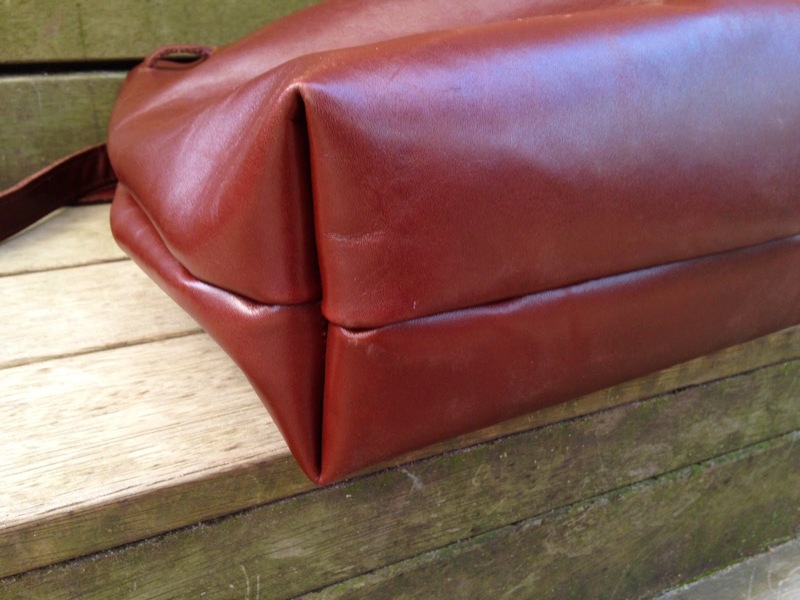 So I mentioned during my last post that I had managed to make my very first leather bag. It took some serious tetris skills to try and piece together the parts to make a strap after squaring off two pieces to make the body of the bag. Leather as most of you would know is super expensive, and not something I really felt the need to spurge on in the past. But lo-and-behold I couldn't help myself when I stumbled across a leather hide. Redcliffs is a country town in Victoria not far from Mildura, and they hold some pretty amazing Sunday markets, which is marked by the fact that without fail every time I visited it had two jumping castles! The Sunraysia Farmer's market is another local country market which featured fresh produce and a stall which made hot breakfast from the ingredients available at the market. These guys at the back are from the local Lion's club (I think) and were cooking bacon off the back of a ute! I didn't think they were allowed to sell golliwogs anymore, well in any case I haven't seen them IRL, only on the cover of an old Enid Blyton book I have. So this leather hide was $10 from a local vintage shop at the Redcliffs markets and I bought it 'just in case'; which is why I have so many boxes of fabric, and am kind of wishing I bought more. The leather was pretty easy to cut with a box cutter. The bag ended up a bit more rectangular than I would like, but I cut the maximum amount that I could out of what was available.This isn't as detailed as most of my tutorials, but the mood struck me, and my camera was being unhelpful, but this bag uses many techniques that I have shown on my blog before. 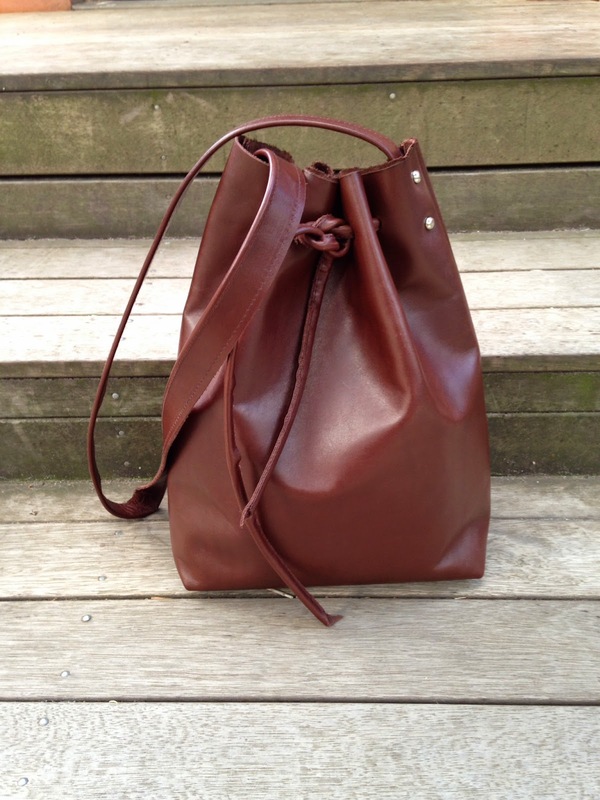 The bag I made was a lazy bucket bag, rather than the traditional one with the circular base as I wasn't sure my machine could handle it. 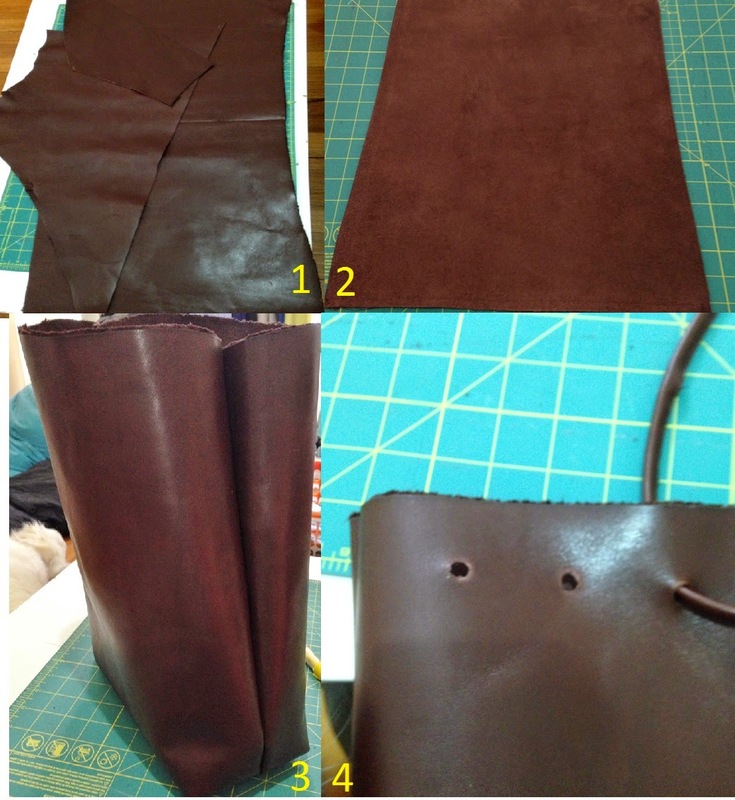 The best part of using leather is that you don't need to finish the edges or line the bag necessarily, and given my laziness, I didn't find it necessary. 3. Sew the two rectangles along both long sides and along one of the short sides. Box the corners by pinching a triangle 3" long. As per this wet bag tutorial. 4. Using a leather hole punch you will need to punch 12 holes. The holes need to be punched at the following intervals from the side seam, about 1.5" from the top of the bag: 2", 3", 4.5", 7.5", 9", 10" and the same on the back of the bag. 5. 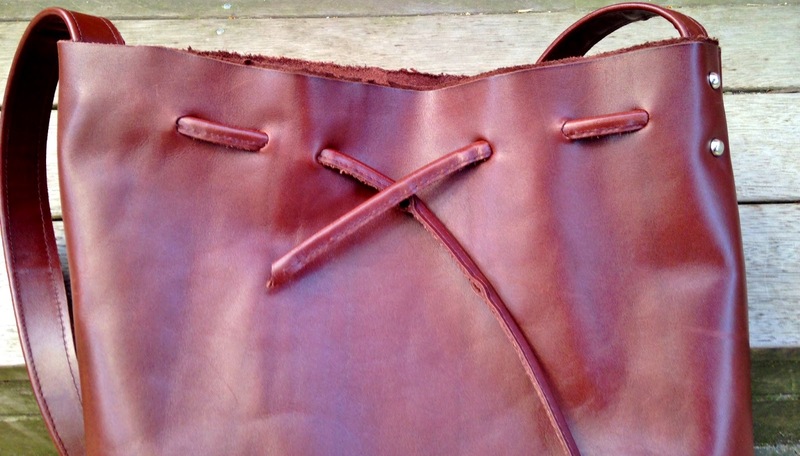 For the straps you need to fold the leather in half lengthwise and sew alongthe two raw edges. If similar to me you do not have enough leather you can join two opposing diagonal cuts of leather with a zigzag stitch, as shown in the top left corner on the shoulder strap. 6. 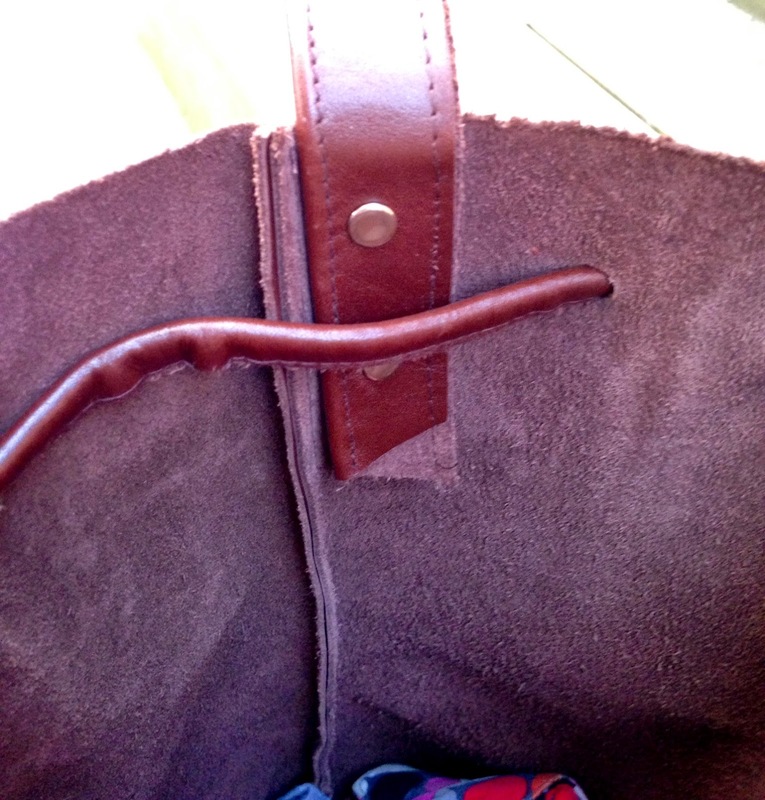 The drawstring should be threaded through in the following way to ensure that the front centre drawstring can be tied. 7. To finish the bag off you need to attach the straps. Same as the drawstring you need to fold the fabric in half lengthwise however this time I sewed both sides. I used rivets to attach the straps. 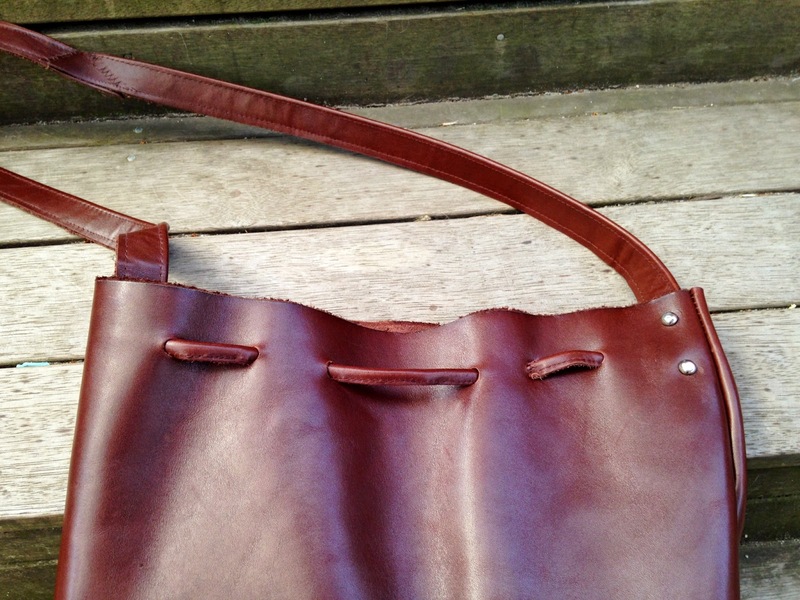 I used two rivets at the front of the bag, and used two rivets at the back of the bag to balance the bag. I wasn't sure my rivets were long enough to go directly through the side seam. If you need help use this tutorial. 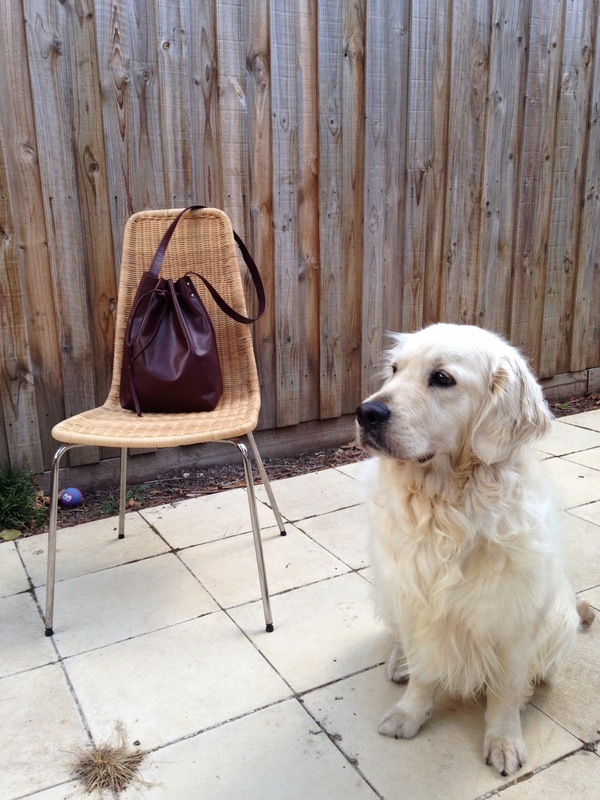 This is my attempt at setting up an impromptu photo shoot and Russell dutifully guarding my bag.I'm surprised he didn't try to chew the leather. Well done, the bag is gorgeous! Thanks for stopping by and commenting. I think the thing with leather and beautiful fabrics is to have simple projects to show case them, this was one of those, with the added benefit of not having to line or finish the seams. 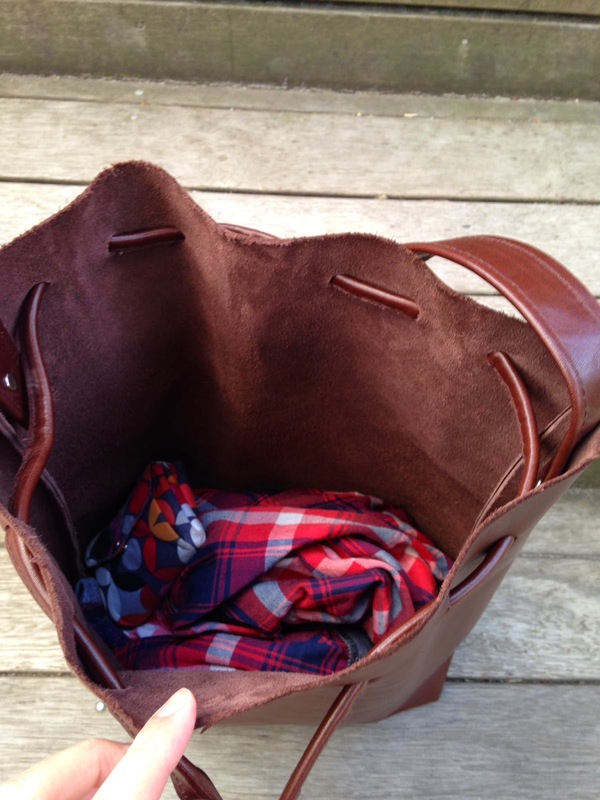 Leather is such a beautiful fabric to work with and shines all by itself without a complicated pattern. Good luck with your leather working, can't wait to see the finished product. I just wanted to turn everyone on to a great leather supplier out of NYC. They are called District Leathers. Their website is http://www.districtleathers...and they are super friendly and helpful. They carry all types of leather that you can take out right from their showroom on 263 West 38th St. (15th floor) in NYC. No appointment necessary.